Harry and three of his friends--Arnie, Walt, and Sulo--sat at a table, sipping wine, and swapping stories. They were all enjoying the hospitality of Sulo Lahti's barn/winery. Sulo lived on a small farm just outside of Clatskanie, Oregon. Everyone knew that Doc Harry was an expert on practically everything. Harry had almost complete recall and was known to never forget a joke, tall tale, or trivial fact. No one questioned the fact that Harry felt fully qualified to lecture his friends on Bigfoot. "Bigfoot actually exists," related Harry. "What we have is a North American Forest creature, a higher primate. It is not an ape and most certainly not human. The creature is almost entirely nocturnal. Sasquatch can see in the dark as well as you can see in daylight." Walt Karnosh pushed his glasses up on his nose and commented, "Even with glasses, I can't see any too good day or night." "Sasquatch has superb night vision, and unlike most apes, is an excellent swimmer. These creatures can travel vast distances. It is not unusual for a Sasquatch to travel over 50 miles in a day. There aren't a whole lot of them, so they have a unique scent that they give off to attract others of their kind. Arnie Heikkinen's eyes narrowed as he looked at Harry though a jelly glass filled with wine. "They give off a smell huh? If it ain't an ape, and it's not human, what is it?" Harry licked wine off his upper lip. "I believe that Bigfoot is a living fossil, Gigantopithecus blackii. Gigantopithecus originated in China and was the largest primate that ever existed. I have been informed that some of these animals were over 10 feet tall. 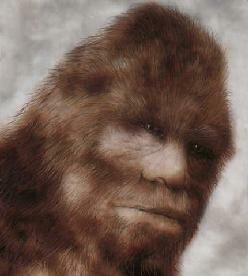 There is a possibility that Gigantopithecus didn't become extinct and continues to exist as Sasquatch and the Yeti. I believe that they may have crossed the Bering Land Bridge, the same way that people are thought to have entered the New World." "If there are such things, how come we don't have any bones," said Arnie. Doc Harry poured himself some more of Sulo's wine. "It could be that we already have Sasquatch bones. It's just that they haven't been recognized as such. Gigantopithecus teeth were collected in China for years and were labeled 'Dragons Teeth.' Until recent times, people didn't know what they were." "I don't think so," said Arnie. "There have been lots of sightings out here," said Harry. "The Native Americans in this area called them "Selahtik," and they treated them with respect." "Sort of like we treat you," jibed Sulo, who up until this time had remained quite. "They had a lot more respect for these creatures than you nimrods have for me," responded Harry. "One of the earlier sightings was in 1850 by Mt. St. Helens. This sighting was reported by a Rocque Duchney, who said the creature beckoned to him." "What did Duchney do?" asked Arnie. "He ran like hell," answered Harry. "There have been lots of sightings around Mt. St. Helens. In 1917, Albert Fletcher was walking along the Cowlitz River and was followed by a 7-foot-tall Bigfoot. In 1924, Fred Beck (a Kelso, Washington resident) and four other miners were attacked by a group of Sasquatch some 8 miles from what used to be Spirit Lake. One of the miners took a pock shot at one and probably pissed them off. They pelted Beck's cabin with rocks, and scared the living hell out of everyone. There have been lots of recent sightings by Mt. St. Helens, including a number of people sending in reports of a Bigfoot-like creature standing in front of a Silver Lake photo studio."